I think a little bit of Scoop, our old cat who passed away last September, is back. I made some chicken liver pâté last week. We were eating some on toast when Target turned up, whiskers twirling with interest. I gave him a crumb and he wolfed it down. A teaspoon later, it was obvious our kitten like the stuff. Thing is, chicken liver and chicken liver pâté were always two of Scoop's favourite things. Scoop preferred boiled chicken liver to commercial cat food, so I went to the market twice a week to serve our old fuzzy his favourite dish fresh. Now Target liked cat food when he first joined us but lately he's been sticking to biscuits. After the pâté incident I tried him on boiled chick liver and he went nuts over it. I still miss old fuzzy very much. I expect to see him sitting at the gate when I come home, and I haven't dared move his towel from his kitchen chair or the box under the window where he used to window-watch (ie spy) on the neighbours. So when I see Target in the kitchen guzzling liver I just need to half close my eyes - and it looks just like Scoop is back. I've decided it's a good thing. For more cat blogs look to the scrolling list in the left menu or click the link below. And please, if you are taking part in Cats On Tuesday, join us with Mr Linky! 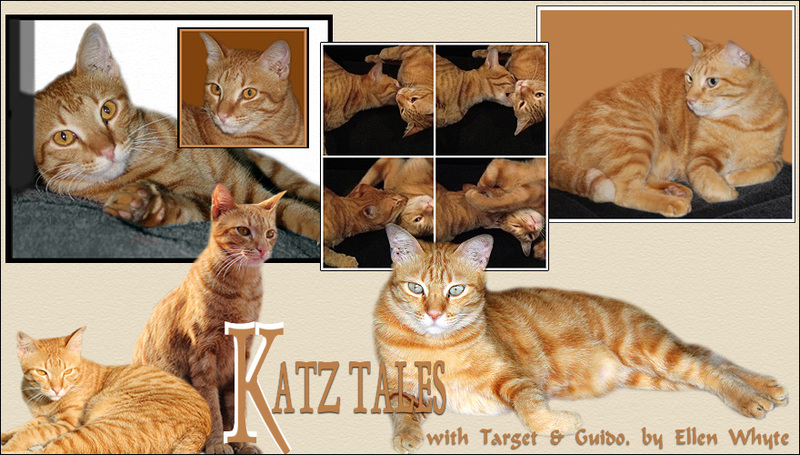 Oh Katztales: I remember those feelings after losing Frankie. It happened to me for years. I still have his photo on my bedstand. But the memories are wonderful: how he used to curl up under my arm. I thank you for reviving those old, old memories! I think that is so true. After all, do cats ever really leave us? I am sorry I scheduled the COT post with the wrong date and only realized it now ! You know all three of my cats I had lost because of old age are still with me and the first one I had 40 years ago ! You never forget and that's good. My very first cat also loved liver and at that time there were no commercial cat food, so for 20 years she ate chicken liver with bread or potatoes or rice but of course preferred to eat only the liver ! My Ginger used to love liver too. It's true that our pets never really left us. Sob~ Sob~ I get real emotional reading about the lives of all those angel cats. None of my cats since my childhood days died in front of my eyes. They just disappeared. It's wonderful to have such memories and a new young kitty all at the same time. We do miss them when they're gone, even if they really don't ever leave us. We think that they are always in your heart. We kitties always live on in the hearts of our humans. Our mom still gets misty-eyed when she remembers the one who came before. Ah....I could do with some liver pate myself....anyone wanna share their recipes??? What a nice story. There could be a little Scoop in Target! I think you might need to boil up a chicken liver for Target, and see if he will eat it. Aww, we had a pet cat that passed away too, I miss you Gendut! Monday Mancats: Happy Birthday Qwill!